The 2014 Fight Aging! Fundraiser Starts Now: We’ll Match Your Research Donations with $2 for Every $1 Given – Fight Aging! 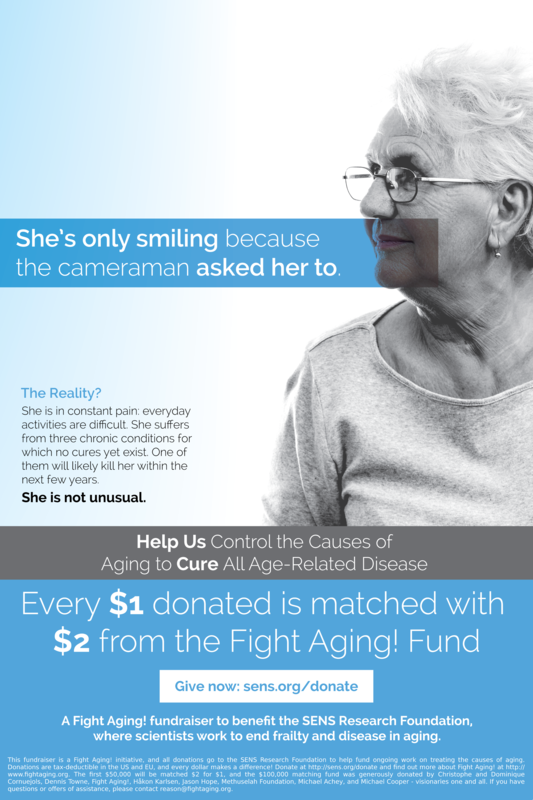 It is that time again, and our 2014 matching fundraiser starts today, October 1st 2014. From now until the end of the year, December 31st 2014, we will match the first $50,000 donated to the SENS Research Foundation with $2 for every $1 given. These funds will help to speed progress in ongoing scientific programs conducted in US and European research centers, their ultimate aim being to repair and reverse the causes of frailty and age-related disease. The SENS Research Foundation is a 501(c)(3) charity and all US donations are tax-deductible. Donations from most European Union countries are also tax-deductible, though the details vary by location. Please contact the SENS Research Foundation to find out more. Who are we? We are Christophe and Dominique Cornuejols, David Gobel of the Methuselah Foundation, Dennis Towne, Håkon Karlsen, philanthropist Jason Hope, Michael Achey, Michael Cooper, and Reason of Fight Aging! 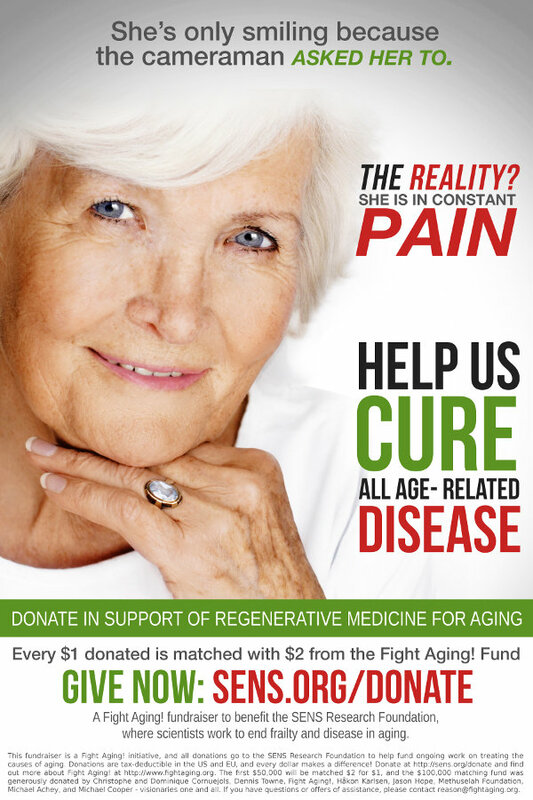 We are all long-time supporters of SENS research aimed at rejuvenation through repair of the known root causes of aging. The few types of cellular and molecular damage that accumulate in all of our tissues cause progressive dysfunction and eventual death for everyone - unless something is done to stop it. This cause is important enough for everyone to do their part, and for us that means putting up a $100,000 matching fund we want you to help draw down: for every dollar you donate, we will match it with two of our own. Early stage medical biotechnology research of the sort carried out at the SENS Research Foundation costs little nowadays in comparison to the recent past. The cost of tools and techniques in biotechnology has plummeted in the past decade, even while capabilities have greatly increased. A graduate student with $20,000 can accomplish in a few months what would have required a full laboratory, years, and tens of millions of dollars in the 1990s. All of the much-lamented great expense in modern medicine lies in clinical translation, the long and drawn out process of trials, retrials, marketing, and manufacturing that is required to bring a laboratory proof of concept into clinics as a widely available therapy. The SENS Research Foundation is focused on early stage research, following a plan that leads to technology demonstrations in the laboratory. With a proof of concept rejuvenation therapy the world will beat a path to their doorstep in order to fund clinical translation. The real challenge is here and now, raising the funds to get to that step. A few tens of thousands of dollars means the difference between a significant project delayed indefinitely or that project completed. To pick one example, last year the community raised $20,000 to fund cutting edge work in allotopic expression of mitochondrial genes, a potential cure for the issue of mitochondrial damage in aging. That was enough to have a skilled young researcher work on the process for two of the thirteen genes of interest over a period of months. It really is that cheap given an existing group like the SENS Research Foundation with diverse connections and access to established laboratories. Don't forget to tell your friends about this fundraiser. Talk to your community, online and offline. Consider running local events to help meet our goal of raising $50,000 from a grassroots community of supporters. The more people who know about the prospects for near future therapies resulting from rejuvenation research of the sort carried out by the SENS Research Foundation, the easier it becomes to raise funds and obtain institutional support for these research programs in the future. Take a look at the generous spirit displayed at /r/Futurology, the futurist Reddit community, when given the chance to help. Scores of people there have already donated modest sums to the cause in response to our fundraiser: many thanks to you all! The 1st of October marks the launch of this fundraiser, but it is also the International Day of Older Persons, and the International Longevity Alliance would like this to become an official Longevity Day. This year, just like last year, groups of futurists around the world will be holding events to mark the occasion, and this includes the scientists and advocates present at the 2014 Eurosymposium on Healthy Aging. The full size graphics here are large enough for 24 x 36 inch posters, but are also suitable for page-sized fliers. The original Photoshop files are available on request, but are a little large to put up here. Make as much use of these as you like - please help to spread the word and help this fundraiser to meet its target. It's not everyday we get a $100,000 gift. And the gift of medical research into stopping our bodies deteriorating with age is the best gift anyone could ever hope for. I'll definitely be putting significant money into this. Unfortunately the bank was closed when I went to put money in my account, so it will have to wait a few days. For all you Amazon users, there's a function called Amazon Smile (http://smile.amazon.com/) where it donates 0.5% of the price of anything you purchase to the charity of your choice. You can set the SENS Foundation as a charity. I selected SENS Foundation in Amazon Smile. It's only a stingy 10 cents for a $20 book though, so people will still want to make their own large donations to SENS. I recommend setting up a monthly donation. I think regular small donations are the way to go. I'd like to know how SENS is going in their fundraiser. I think a lot must be happening behind the scenes because it's almost december and we have no annual report. @Michael-2: I suspect the Rejuvenation Biotechnology 2014 conference is probably the reason why the report is will be later than we'd like: hosting a conference is a time sink like no other, and for all the same people who would be putting the report together. @Michael-2: The thermometers are going to be updated weekly or thereabouts. That's an improvement over last year, and perhaps next year we can aspire to something more sophisticated given the continued growth of science crowdfunding platforms. Preexisting monthly donors are not being counted for this initiative, I believe, and the $3,441 was largely from /r/Futurology readers earlier this week.